With the latest announcement of SharePoint 2016 releases in last few months, Hybrid has been the most popular word across the community and users. There are various scenarios and requirements yet Microsoft on its way of concluding this. However, not to be surprised much because Hybrid isn’t that new ! It’s been there for 2013 as well. First of all, What is Hybrid ? The name says it all. Hybrid is when you have some set of SharePoint services runs On-Premise and some on cloud. This isn’t new in SharePoint as it has been already there from 2013 as well. Microsoft has made it much more broader and robust with SharePoint 2016. Some of the organizations may not have an interest yet in going completely cloud based but to keep a foot on it with few services and that’s where SharePoint 2016 going to play a big role. SharePoint 2016 has been introduced to make that leap easier by providing better tools. 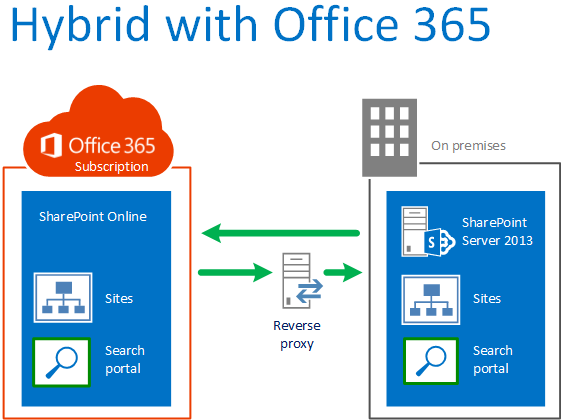 Hybrid Sites allows you to keep some SharePoint sites on-premise and some on the cloud (Office 365 ultimately). As Regulatory Compliance is the main point blocks many organizations (Specially Government Entities) of moving to the Cloud, Hybrid Sites would be the strength to move forward. A Simple Example: If ABC Corp has an intranet Built on SharePoint On-Premise and there are many legal and finance records stored in some of the sites in it. In this scenario Regulatory Compliances block ABC crop from moving to cloud entirely. Using Hybrid Sites capability, ABC can host selected set of Sites in Office 365 (SharePoint Online) and let the other (Legal and Finance) sites remain in On-Premise. With Hybrid Profiles you don’t need to have a heavy On-Premise SharePoint Setup with User Profiles Services running on it. Instead just let the Office 365 play that role for you so that you can make your servers light weight and lesser management overhead. Having the Profile in Cloud will also a huge benefit as you will get the latest updates that Microsoft deploys to Office 365. Having User profiles on Cloud will also benefit (Depends on the O365 Plan Mostly) users with latest features such as Planer. 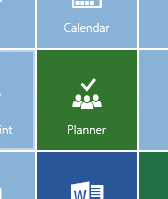 Planner is the latest replacement of “My Task” SharePoint feature which is now available in Office 365. This feature hits the ceiling of User adoption and productivity indeed. With “Planner” my tasks and timeline is nicely presented and made user friendly. Isn’t this gorgeous dashboard impresses you to have your tasks over here ? Depends on your Decision to host services either On-Premise or Cloud, OneDrive can sit anywhere you want. If ABC Corp do not want to expose their user’s content to the cloud, they can keep OneDrive (MySites Ultimately) On-Premise. Or simply go for Office 365 and let it host the service so that there is no additional storage cost or management overhead for ABC Corp.
App Launcher was introduced in to SharePoint 2016 now. This was one of the attraction used in office 365 to make the navigation of Apps easier. With the configuration of Hybrid Services, you will get the App Launcher of your In-Premise SharePoint Portal modified accordingly. Each link will direct your users to relevant destinations without hassling around. Hybrid Search What if you could get a single Unified Result set even though you have content in On-Premise Sites and SharePoint Online Sites ? That’s the whole idea of Cloud Search Service application which delivers the capability of Crawling your On-Premise and Online content centrally yet unified. 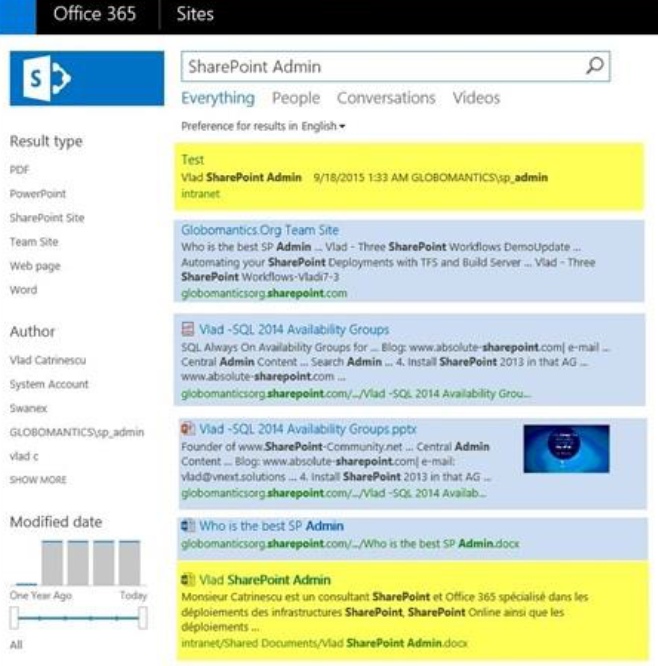 The Results Highlighted are from On-Premise Content and others from Cloud (SharePoint Online). Cloud Search Service Application is a ultimate Standout here. Lot more to write about and I will keep posting on configuration of Hybrid features soon as well. till then happy flying towards cloud folks !